Our custom engraved metal wallet inserts are a beautiful way to share your thoughts. They make wonderful gifts for your loved ones, that will stand the test of time. Our wallet inserts are carefully laser engraved by our Etchey craftsmen. 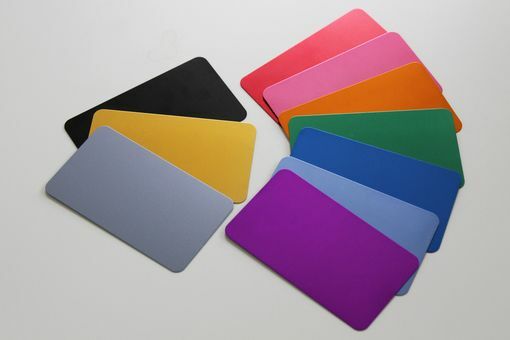 Each card is constructed of ultra thin anodized aluminum. The engraving will not fade or scratch off. 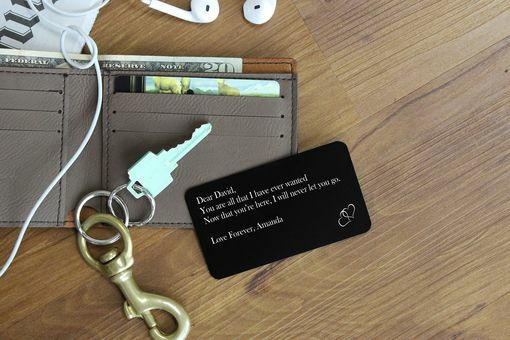 The engraving is white no matter the card color. Another awesome experience from start to finish. Willing to work with you on customization at an amazing price. Lightning fast turnaround time. I honestly cannot say enough about my experience with Etchey. Absolutely went above and beyond my expectations. Worked with me to make everything perfect. They took so much time ensuring that every detail was exactly to my specifications. For someone like me, who is the opposite of artistic, they made the process so easy and walked me through every step to make sure I was getting exactly what I was looking for. The final product was exactly the custom gift I was looking for. Truly, a great experience - and that doesn’t even mention the value! You really cannot beat this level of customer service and quality at this price. Thank you! !